If you haven't read the first post about this calculator, containing the download link and the instructions, you should do so first here. Today, we will do a few more runs of some different plans and conditions for our example player and see how his bottom line is affected. I strongly recommend that you download the spreadsheet and play along at home with your own personal situation to see how it compares to the cases discussed here. 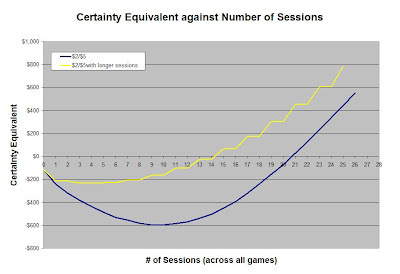 The examples I go through will illustrate some important overall trends, but there should be substantial differences in the magnitude of the impacts from player to player. From the first post, we recall that our example player has the following characteristics and pays 2012 federal and New Jersey income taxes as a single taxpayer. We had found that playing his home game ten times and making a trip to a cardroom to play $1/$2 five times led this player to effectively lose $74 on the year. How are different circumstances and decisions contributing towards this loss, and what can the player do differently to try to mitigate it? 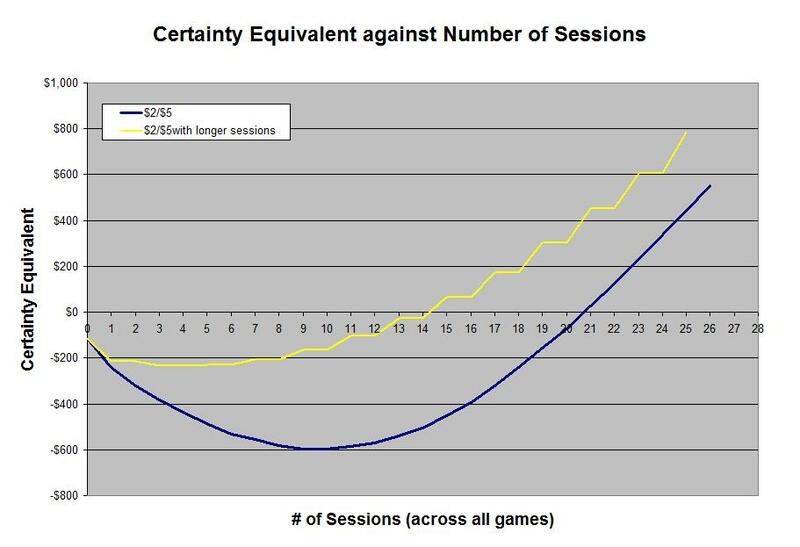 We've seen that the negative tax effects hit the hardest on the very first sessions played in a year. 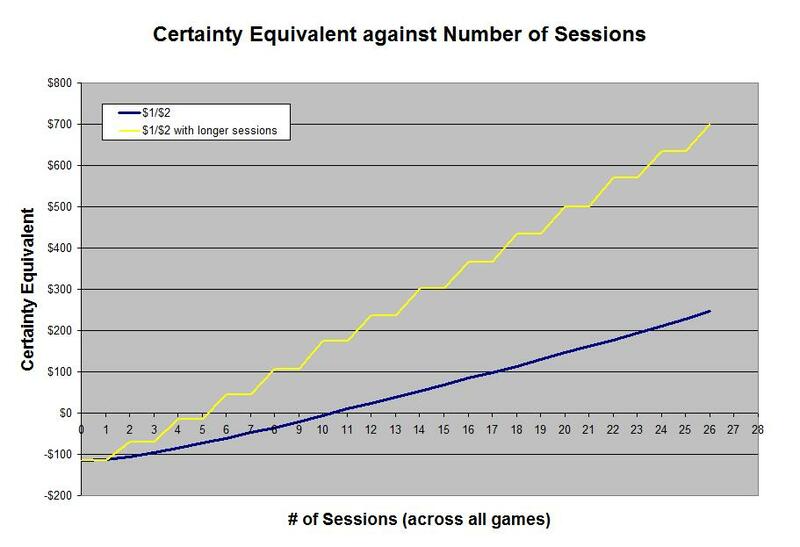 Let's see how the costs look when looking at even fewer sessions than we first considered for this player. Let's assume that our player is totally committed to playing his home game at least occasionally. The social value is worth it to him, even if the tax effects do end up making it cost him money on average. How much is he losing? We run the spreadsheet for different session counts of the home game (with zero live cardroom trips) and look at the three charts produced by the file, located in the three yellow tabs at the bottom of the spreadsheet. 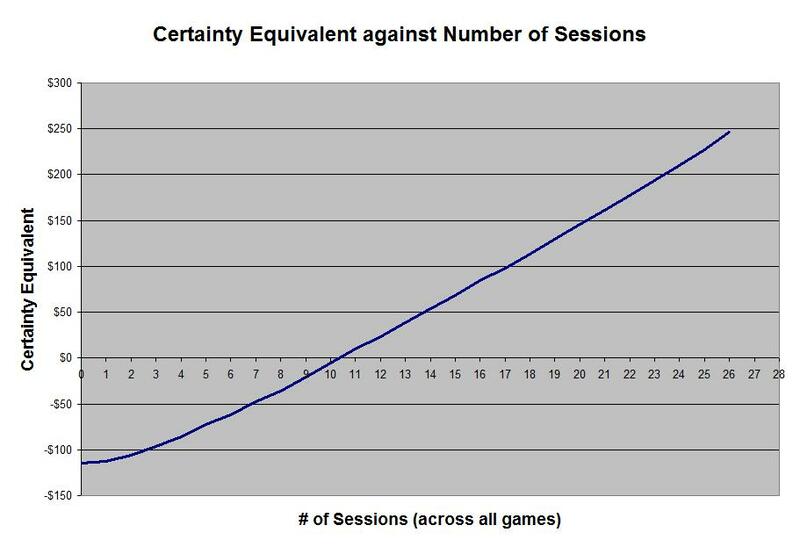 The first chart shows the year-end certainty equivalent as a function of the number of sessions played. 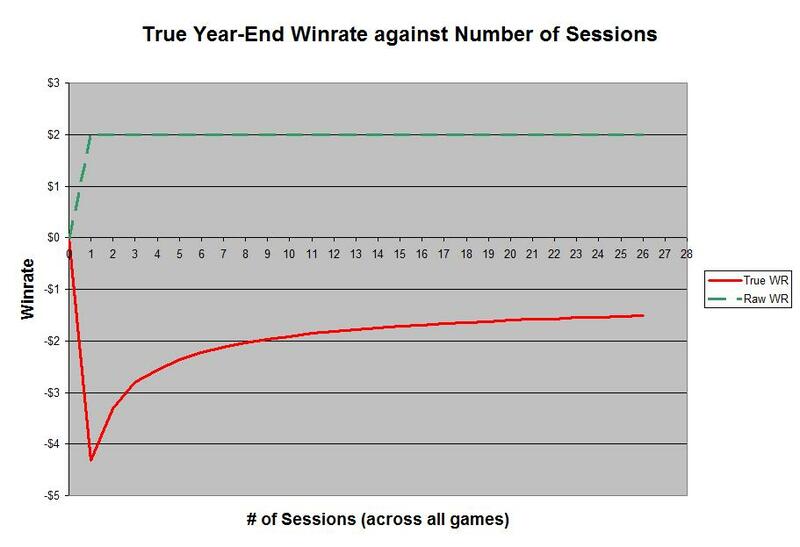 The slope is more negative for the first few sessions as the player starts cutting into the standard deduction and risks a losing year. 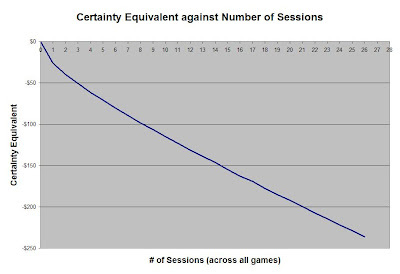 As more sessions are played, the slope increases (though it nonetheless stays negative here), which will generally be true for any game and for any set of inputs. 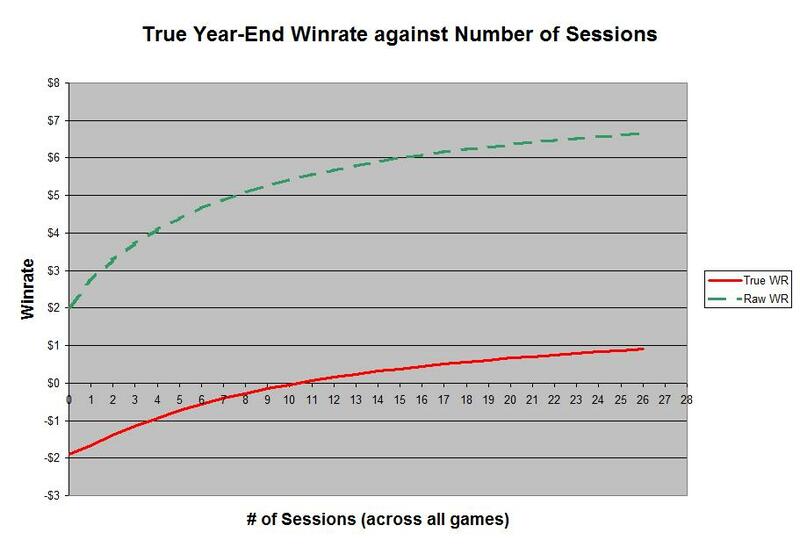 The second chart plots the true year-end winrate against the raw year-end winrate (the before-tax information provided by the player), again plotted against the number of sessions on the x-axis. 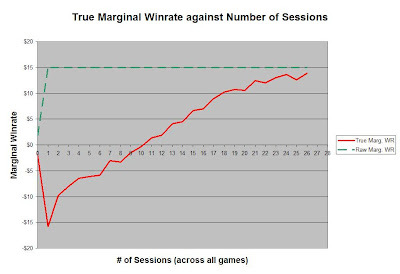 The red line, representing true winrate, can never exceed the dotted green line of the raw winrate, though it will approach it as volume of play increases. For this particular home game, we see that it's not even close. 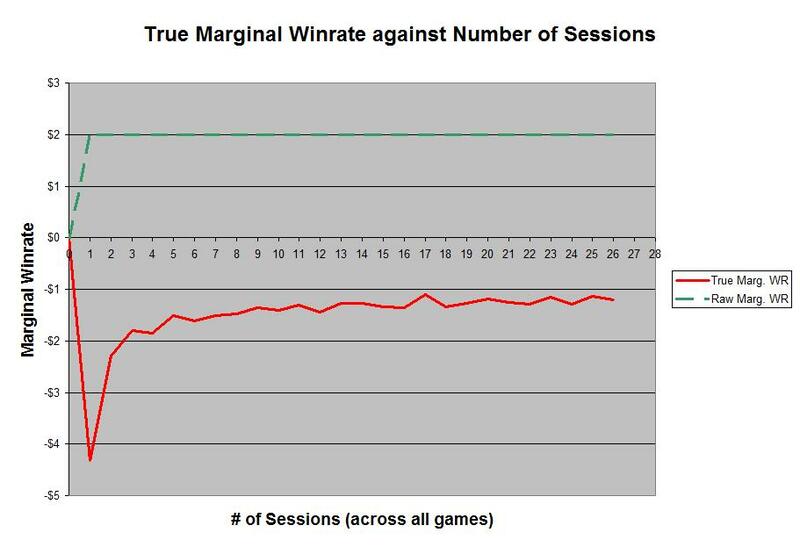 In most situations, after a certain number of initial sessions to cover the biggest negative tax effects, the marginal winrates should increase as the number of sessions increases. So, yeah, ouch. 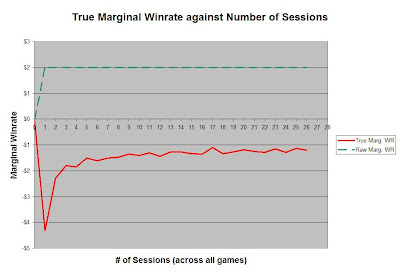 The variance is so much greater than the tiny winrate of the home game that it's a losing proposition even if 26 sessions of it are played. It turns out that our player, if playing only this home game, would have to play the game almost 200 times just to break even in certainty equivalent for the year! The loss of the standard deduction and the effect of a losing year is absolutely brutal for smaller-stakes players and where edges are thin relative to variance. This would not be a good game to play to attempt to derive any profit from, but, if the primary motivation is having fun, it's only going to cost $114 in certainty equivalent to play this game ten times for the year. Frustrating, but probably worth it. 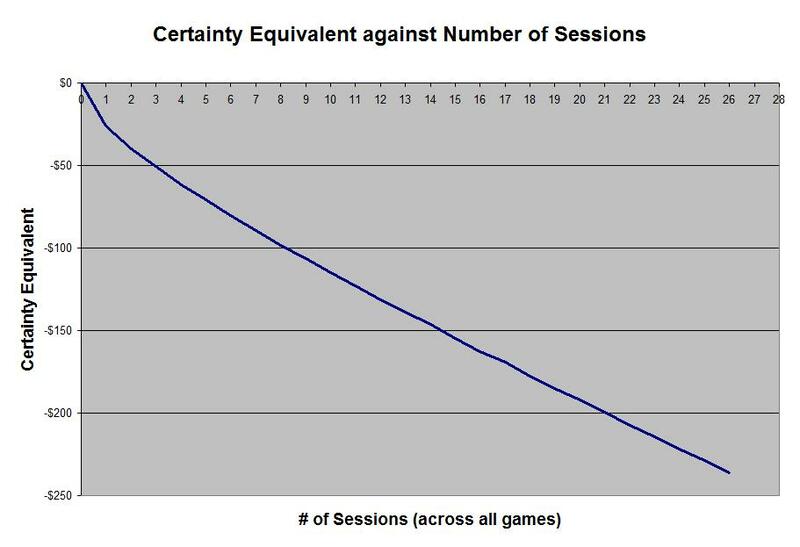 Let's assume that our player will play his ten sessions of the home game no matter what. Then one of the only variables that he has any meaningful control over is the number of trips he makes to the local live cardroom, where we presume that profit is a bit more of a goal here. How many trips will he have to make before he ends up effectively ahead for the year? Well, here's one answer — our player will, on average, effectively make money for the year if he's able to make 11 trips to play $1/$2. Unfortunately, his hourly rate is still quite low compared to his raw winrate, showing that the negative tax effects are having quite an impact. 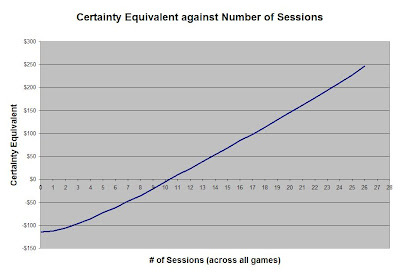 The effective profitability of any given session goes up as the number of other sessions increases. What if he were to play $2/$5 instead? 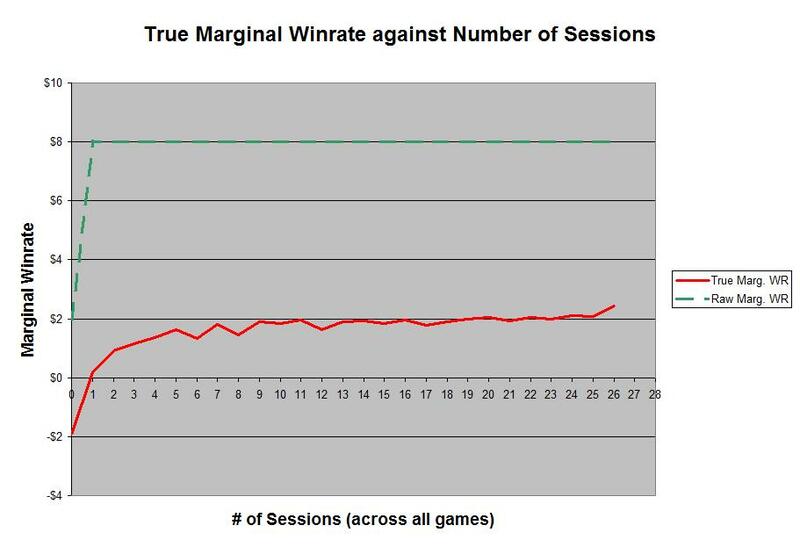 His raw winrate goes from $8/hr to $15/hr, but the standard deviation increases by 180%. How will the interplay of higher winrate and higher risk affect decisions for the part-time player? 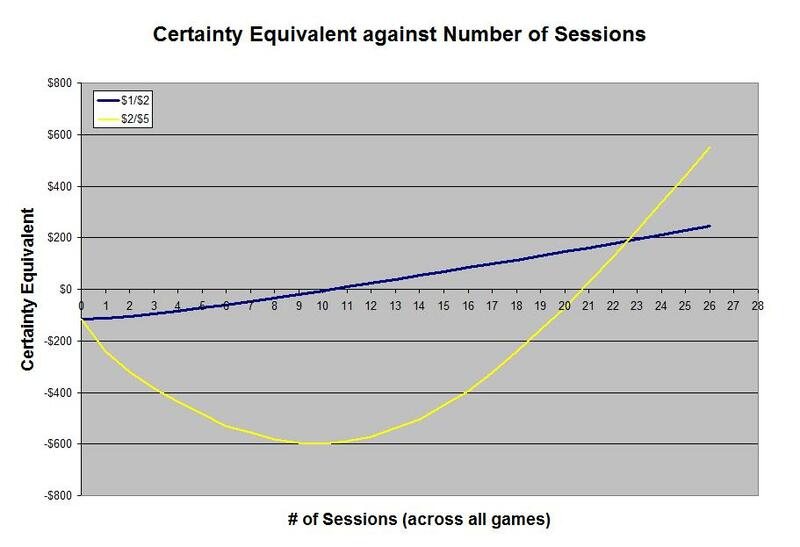 Here, I've plotted the $2/$5 results in a yellow line against the $1/$2 results in blue. The shape of the $2/$5 curve is quite different. Playing $2/$5 instead of $1/$2 demands 21 trips to the cardroom to break even, rather than 11. However, $2/$5 will be more profitable than $1/$2 if the player ends up playing more than 23 cardroom sessions. Games with higher winrates but higher variance will take more sessions to become profitable after tax, but will converge to raw winrates faster. 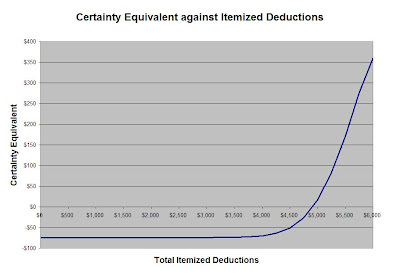 Since the effect of the loss of the standard deduction is a byproduct of the necessary session-by-session accounting for amateur players, it would always be desirable to group more of a player's poker results into a single session. 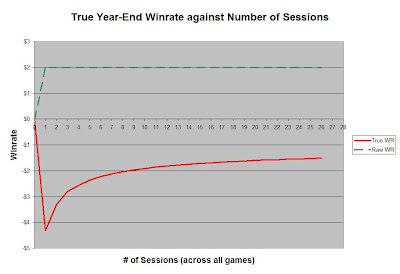 Since there's currently no acceptable argument that a week/month/year of poker play can be considered a single session, the only way to achieve this is to actually play longer hours in each session. So, what if our example player had the stamina to be able to put in 16-hour-long sessions at the live cardroom instead of twice as many 8-hour-long sessions? 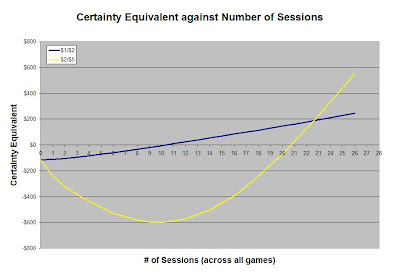 For $1/$2 play, we plot the original 8-hour session plan in blue and the 16-hour session plan in yellow, where we count each 16-hour session as two spots on the x-axis so that the two lines correspond to the same amount of hours played. Playing a longer session instead of multiple smaller sessions can substantially reduce the negative impact of the potential loss of the standard deduction. 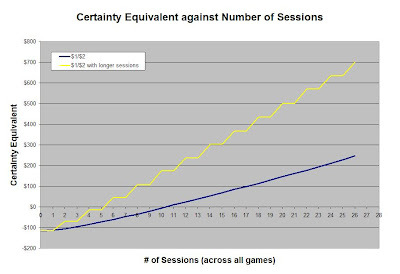 Restricting our attention now to the original case of ten home game sessions and five $1/$2 sessions, how much better off would our player be if he had more possible itemized deductions? In reality, taxpayers rarely have control over their non-poker itemized deductions, but it should also be noted that this includes year-to-date losing poker sessions. For example, if the player has $4,000 in other itemized deductions for 2012 and has already booked $2,000 in losing sessions so far in 2012, the tax effects for the purposes of future decisions are the same as if he had $6,000 in itemized deductions and no losing poker sessions. 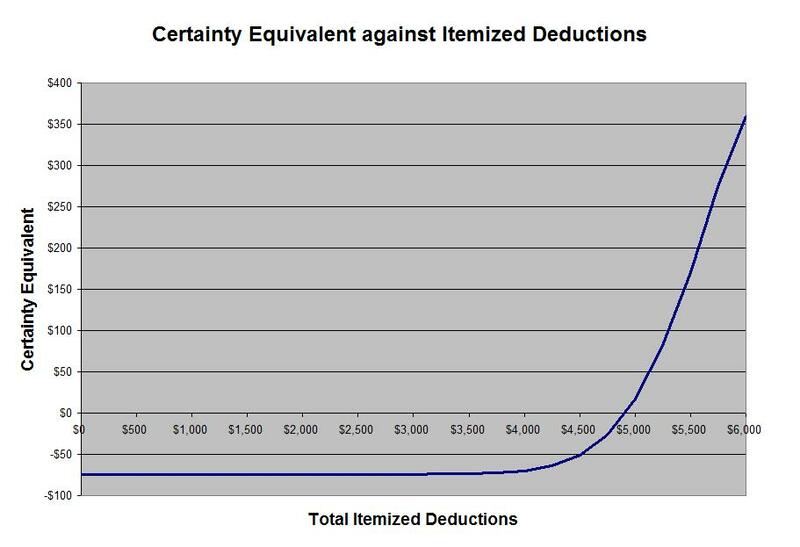 An amateur who has accumulated enough losing sessions and other itemized deductions to come close to or exceed the standard deduction is able to retain much more of the value of his future play for the year. These different cases illustrate how significant the effective costs and expected after-tax payoffs from a part-time, amateur poker career can differ based on individual facts and circumstances and as losing sessions are accumulated throughout a given year. The rules of thumb in this article can shape your intuition for understanding some overall effects, but intuition is still not going to be a reliable means of approaching this calculation. It's best to continually update and use the spreadsheet yourself.